The great thing about this outfit is that it is so comfortable that it feels like pajamas. The skirt is jersey (still having to wear my maternity clothing – boo) and the tank is cotton so they are both super comfortable. I'm right there with you. I haven't been brave enough to try on many of my clothes. I keep making a pile of clothes I should never wear again. And then I wear them. 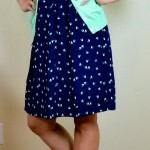 Have you considered purchasing a few pieces from ThredUP or LikeTwice to help you through this transition. After my last baby was born, I had gained 20+ lbs and needed some professional clothes. I didn't want to spend too much because I already had a professional wardrobe…it just didn't fit. I bought a few pieces from Thred Up at a fraction of the cost and it really helped stretch my wardrobe. Sometimes, you can even find clothes with the tags still attached. Like you, I love the Express Editor pants and I have been fortunate to find them on Like Twice and Thred Up for about 20.00 and they still look new. 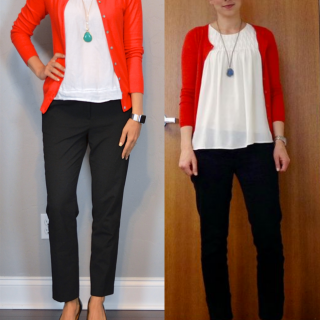 Also, I recently bought an Express blazer for $25 and a JCrew blazer for $45.00 from Thredup. Just a thought. I'm wearing almost the exact same thing today and completely agree about how comfy it is! Actually I love hearing about your struggles and your progress- it's not repetitive at all and is just a reinforcement of how normal you are. You look awesome!! The struggle is real. Im two months pp and feel your pains. I love your blog and the updates on your progress so keep them coming. You're doing great & definitely not alone. Getting dressed seems simple enough, but finding clothes that flatter (or heck, even fit) after pregnancy is a true challenge, especially when you need to be professional. For many, it takes months to get back to pre-pregnancy weight, if they do at all. And personally, I found that even once I was back to pre-pregnancy weight, my body shape was different, and certain styles of clothes where just no longer flattering. I find your recent posts to be refreshing, because they are realistic and truly relate-able. I'm with HeyBecky J. I'm almost 9 months post-partum and only 5 lbs up from my pre-preggo weight and about 90% of my old wardrobe fits, but my body shape is very different. Many things in my closet that used to flatter and be on heavy rotation just don't work on my body anymore. I feel like I'm re-learning how to dress myself, and it can be frustrating (especially without a bottomless bank account), so I appreciate seeing you tackle it too. I don't find boring or repetitive that you talk to us about what you're wearing with your new body/weight. I want to thank you for that. I have a big gut that just doesn't want to go away! No matter how good I eat and exercise. It turns out I might be insulin resistant, and now I have to learn how to eat to not become diabetic (I'm determinate to beat that resistance! ), and sometimes it's a struggle to find clothes that looks good, yet professional. I will still read your blog no matter what size you are, I really like your style. It's totally ok! I just defended my dissertation (hello, stress!) so none of my clothes fit right now either. Life happens!! Thanks for the tip. I've never used ThredUp or LikeTwice. They sound useful! I echo everyone else's sentiments: you're not boring or repetitive! I struggled with my postpartum wardrobe, but none of my other mama friends talked about it, so I thought I was the only one. I'm glad to know I'm not alone! And I also have found that while I've gotten back to a place where stuff fits – it definitely fits differently than it used to. So I'm curious to see your experience with that too! Thanks for commenting. It does make me feel better to hear about other people's struggles. Sometimes it feels like you are the only one going through stuff like this… I'm glad to hear you're back into your regular wardrobe!